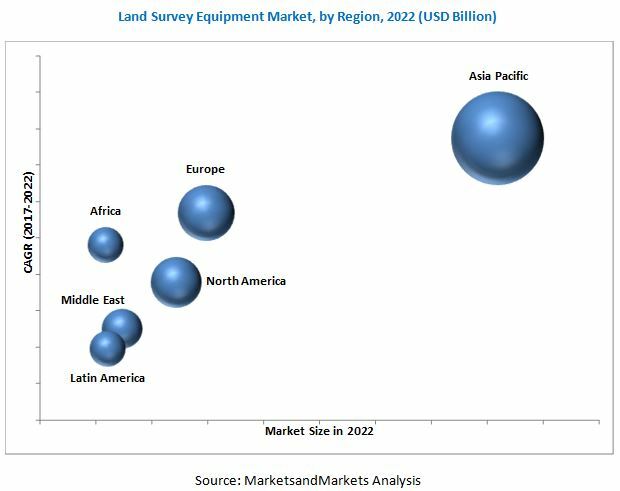 [173 Pages Report] The land survey equipment market is projected to grow from USD 5.42 Billion in 2016 to USD 8.70 Billion by 2022, at a CAGR of 7.67% during the forecast period. The base year considered for the study is 2016 and the forecast period is from 2017 to 2022. The report analyzes the land survey equipment market based on product (GNSS systems, total stations & theodolites, levels, 3D laser scanners, lasers, and Unmanned Aerial Vehicles (UAVs)), industry (construction, oil & gas, mining, agriculture, disaster management), application (into inspection, monitoring, volumetric calculations, layout points), software (construction software, oil & gas software, mining software, and agriculture software), end user (commercial, defense, and research), and region (North America, Europe, Asia Pacific, Africa, Middle East, and Latin America). The report provides in-depth market intelligence regarding the land survey equipment market and major factors, including drivers, restraints, opportunities, and challenges that may influence the growth of the market. It also provides an analysis of micromarkets with respect to individual growth trends, growth prospects, and their contribution to the overall market. The report also covers competitive developments such as long-term contracts, new product launches and developments, and research & development activities in the land survey equipment market, in addition to business and corporate strategies adopted by key market players. The market size estimation for various segments and subsegments of the land survey equipment market was arrived at by referring to varied secondary sources such as Hoovers, Bloomberg Businessweek, Factiva, annual reports, publications, etc. Furthermore, market triangulation was performed with the help of statistical techniques using econometric tools. All percentage shares, splits, and breakdowns were determined using secondary sources and verified through primary sources. All possible parameters that affect the market have been accounted for, viewed in extensive detail, verified through primary research, and analyzed to acquire the final quantitative and qualitative data. This data was consolidated with detailed inputs and analysis from MarketsandMarkets, and presented in this report. 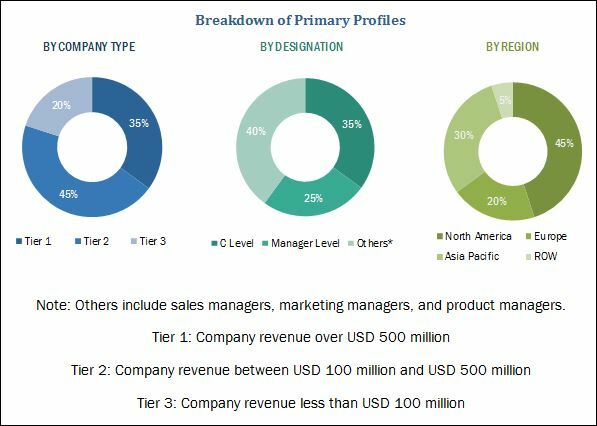 The land survey equipment market ecosystem comprises manufacturers such as Trimble (US), Hexagon (Sweden), Topcon (Japan), Meggitt PLC (UK), Hi-Target (China), CHC-Navigation (China), Suzhou FOIF (China), Stonex (Italy), etc. The land survey equipment market is projected to grow from USD 6.01 Billion in 2017 to USD 8.70 Billion by 2022, at a CAGR of 7.67% during the forecast period. This growth can be attributed to rapid urbanization, development of smart cities, and increasing construction activities in North America, Asia Pacific, and Africa regions. The land survey equipment market has been segmented on the basis of product, industry, application, software, end user, and region. Based on product, the land survey equipment market has been segmented into GNSS systems, total stations & theodolites, levels, 3D laser scanners, lasers, and Unmanned Aerial Vehicles (UAVs). The UAVs product segment of the land survey equipment market is projected to grow at the highest CAGR from 2017 to 2022, owing to the increased use of UAVs for potential commercial applications, and their applicability in mining, surveying, 3D mapping, the oil & gas sector, etc. Based on application, the land survey equipment market has been segmented into inspection, monitoring, volumetric calculations, and layout points. The layout points segment is expected to grow at the highest CAGR from 2017 to 2022. The growth of this segment can be attributed to the increasing focus of manufacturers on the use of IT to plan layouts; for example, 4D simulations, Building Information Modelling (BIM), and others, which can help optimize the layout plan during various phases of construction. Based on industry, the construction segment of the land survey equipment market is projected to grow at the highest CAGR during the forecast period. This growth can be attributed to rapid urbanization in emerging economies of Asia and Africa. Based on software, the land survey equipment market has been segmented into construction software, oil & gas software, mining software, and agriculture software. The construction software segment is estimated to account for the largest share of the land survey equipment market in 2017. The construction software provides customized solutions, specifically designed for different applications, including, construction design and planning, and construction field management. The demand for such customized solutions is one of the factors contributing to the growth of the land survey equipment market. Based on end user, the land survey equipment market has been segmented into commercial, defense, and research. The commercial segment is expected to grow at the highest CAGR during the forecast period. One of the factors contributing to the growth of this segment is technological advancements in land survey equipment to meet the demand for improved survey equipment from land surveyors using these equipment for various purposes, such as construction, agriculture, mining, and monitoring. Based on region, the land survey equipment market has been segmented into North America, Europe, Asia Pacific, Africa, Middle East, and Latin America. The Asia Pacific is projected to lead the land survey equipment market during the forecast period. This market in Asia Pacific is driven by the development of smart cities and rapid urbanization in China, India, and other countries of Southeast Asia. However, lack of skilled workforce and technical knowledge about the use of latest instruments act as a challenge for the growth of the land survey equipment market. Products offered by various companies in the land survey equipment market have been listed in the report. The recent developments section of the report includes recent and key developments made by various companies between 2013 and 2017. Major companies profiled in the report include Trimble (US), Hexagon (Sweden), Topcon (Japan), Meggitt PLC (UK), Hi-Target (China), CHC-Navigation (China), Suzhou FOIF (China), Stonex (Italy), etc. Contracts and agreements were the key growth strategies adopted by the leading players in the land survey equipment market. These strategies have enabled companies to increase their market shares.